Chust knives, Uzbek knives, Handicraft in Uzbekistan, It is interesting, Tours to Uzbekistan. 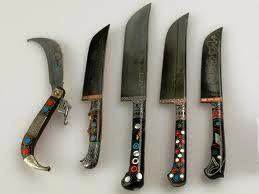 Since ancient times Chust knives have had a great popularity not only in Uzbekistan but beyond. Chust is a small town in the Namangan region, which is famous for the manufacture of knives. Uzbek knives have peculiarities inherent to the culture of the Central Asia. Therefore, the width of the blade is more than the diametre of the handle. Knives can have typesetting or wooden handle. Besides, skullcaps and colorful woven belts were embroidered in Chust. It is considered that every man must have these three things. Uzbek knife is not a weapon but the object to emphasize the status of the owner. Chust knives are distinguished by their lightness and elegance, the tip of the blade is curved upward and the “nose” of the handle is slightly folded down. Masters will always offer you a large selection of knives: with threaded, patterns, with bone or wooden handle, and also with a handle made of horn. It is said that by purchasing a knife, you protect yourself from evil spirits and also it will be your talisman. There is an inscription on the blade of the knife: “Estalik Uchun Chust", which means "In memory of Chust" and its leather case is decorated with simple form embroidered patterns, but the whole attractiveness is in this simplicity. As time goes by, the rule of making national knives is changed, that’s why it is important to note that the modern Uzbek knives can be decorated with non-traditional ornaments, or even cannot be decorated at all. In spite of this, it does not lose the right to be called national knife. Pichak (pchak) - a knife or a piece of art? Chapan - both traditional and fashionable wardrobe item!